The Oster 4722 electric rice cooker will make up to 9 cups of cooked white rice that will be of average, standard quality, is non-stick and easy to clean, comes with a steaming tray for preparing healthy steamed food while the rice cooks below, and remains pretty straight forward to use. Basically that one paragraph above describes this 3 cup raw capacity rice cooker, but to offer a little more insight, let us start out by stating this is one of the most affordable rice cooker/steamer combos in the 3 cup capacity range we have come across that receives a large majority of neutral to positive consumer feedback. 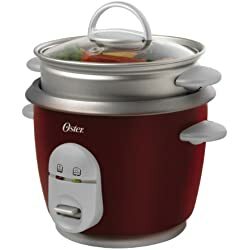 This Oster rice cooker has a dark red color with light grey handles which is sort of hit or miss as far as preferred color scheme, but should fit most kitchen decors. Operating this basic cooker is simple as all the user has to do is measure correctly using the included cup and water level gauges marked inside the bowl, plug in, and push down on a lever. The Oster 4722 Electric Rice Cooker will cook the rice until a temperature sensor detects little water is left and automatically switches into the units keep warm mode that will hold the rice at an ideal serving temperature. The small size is good for single chefs, college dorm life, or for those who just have little counter space to spare. This Oster 3 cup rice cooker comes with a non-stick bowl, special measuring cup, rice spatula, steaming tray, and manual. Granted the cons above are mostly compared to some of the more expensive units and for what this cooker is priced at really remain relative than actual negative feedback. We like this rice cooker and give it a Good rating based on what it offers, what folks say about it, and since it is so budget friendly. Other cookers worth considering and comparing to the Oster 4722 electric rice cooker are the Black and Decker RC3406 and the Aroma ARC-733G.